Stand out gorgeous at the Milan furniture fair was Italian designer/manufacturer Tonelli, who make superb high quality glass furniture. World famous for their research and experimentation, Tonelli are way ahead of the field with innovative glass design. These masterpieces in ‘glass art’ (they really are!) not only look stunning but feature perfectly mitred joins, seamless glass panels and shatterproof glass – and in the five years we’ve worked with them we have never had a breakage! 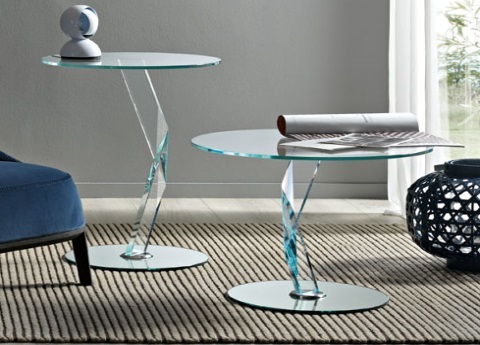 Among the Milan highlights for us were the eye-catching Bakkarat glass side tables designed by D’Urbino for Tonelli, with a thick central twisted glass post and mirrored base. And when you look at them from above you get the amazing illusion of looking down at a crystal. Pretty cool! 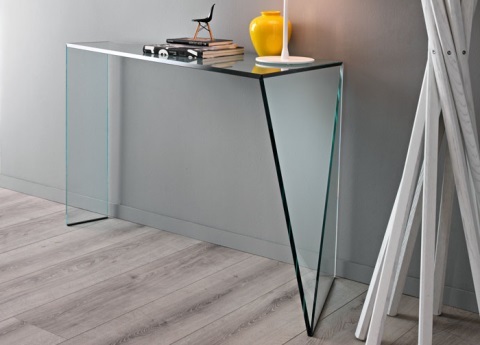 Also pretty cool was the Penrose glass console table by Isao Hosoe – a fabulously angled asymmetric table that comes in a clear or extra-clear (with less of a green tinge) glass. And from the European king of design Karim Rashid (anyone catch his talk at the May design Series last weekend?) the Veer coffee table. 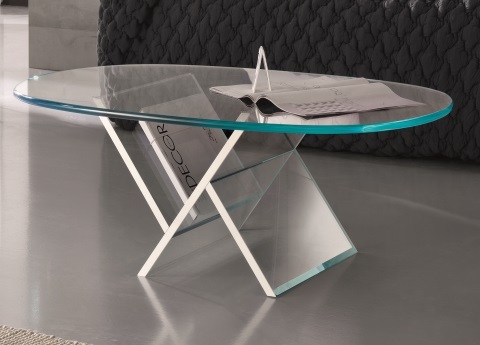 It’s got a perfectly shaped oval glass top and a really unique design feature to the base – a choice of plain edges or lacquered white or yellow highlights, which very cleverly picks out the shape. Looking for a pretty sideboard? Then the Liber glass sideboard should do it! With a smart T shape, the coloured drawers are optional and come in white matt lacquer or name your RAL colour (we’re quite partial to the pink). And cleverly, this sideboard has no ‘back’ or ‘front’ so the drawers can open on either side. There are also some great Liber storage units available with the same clever styling. And…. we’re very excited about this. The showpiece of Tonelli’s stand at Milan and designed to commemorate their 25 years in business (*small drum roll*) VU 200. A fabulous mirror/stunning piece of wall art by Giovanni Tommaso Garattoni. If you’re looking to creates the illusion of more space or reflect tons of light in a cunning way, this is a great piece of design. It’s made of extra clear strips of glass welded and positioned by hand, side-on to a mirror back. Love it! And if this size isn’t quite right for you there are lots of different size options to choose from. To see the 2013 collection click here. Previous PostPrevious Grand Designs Live and our Modulo sideboard!